Albrecht Dürer (21 May 1471 – 6 April 1528) was a German painter, engraver and mathematician. He was born on May 21, 1471 and died on April 6, 1528 in Nuremberg, Germany and is best known as a maker of old master prints. His prints were often in a series, so that there is a group of different prints about a subject. The most famous series are the Apocalypse (1498) and his two series on the passion of Christ, the Great Passion (1498–1510) and the Little Passion (1510–1511). 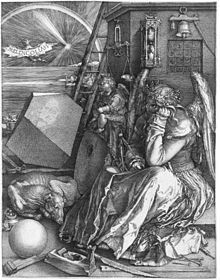 Dürer's best known individual engravings (that is, ones that are not part of a series) include Knight, Death, and the Devil (1513), Saint Jerome in his Study (1514) and Melencolia I (1514). His most iconic images are his woodcuts of the Four Horsemen of the Apocalypse (1497–1498) from the Apocalypse series, the Rhinoceros, and numerous self-portraits in oils. Dürer possibly did not cut his own woodblocks but may have employed a skilled carver who followed his drawings faithfully. He painted a number of religious works in oils and made many brilliant watercolours and drawings, which through modern reproductions are now perhaps his best known works. Dürer's prints made him famous across Europe before he was 30, and many people say he is the greatest artist of the Renaissance in Northern Europe. Dürer was the third child and second son of his parents, who had between fourteen and eighteen children. His father was a successful goldsmith from Ajtós, near Gyula in Hungary. Dürer's godfather was Anton Koberger, who left goldsmithing to become a printer and publisher in the year Dürer was born. He quickly became the most successful publisher in Germany, and owned twenty-four printing presses and had many offices in Germany and abroad. His most famous publication was the Nuremberg Chronicle, published in 1493 in German and Latin. It had 1,809 woodcut pictures by the Wolgemut workshop. Dürer may well have worked on some of these, as the work on the project began while he was with Wolgemut. Dürer had started to learn goldsmithing and drawing from his father. His father wanted him to continue his training as a goldsmith, but he was so good at drawing that he started as an apprentice to Michael Wolgemut at the age of fifteen in 1486. A self-portrait, a drawing in silverpoint, is dated 1484 (Albertina, Vienna). Wolgemut was the leading artist in Nuremberg at the time, and had a large workshop making different types of works of art, in particular woodcuts for books. Nuremberg was a rich city, a centre for publishing and many luxury trades. It had strong links with Italy, especially Venice, a relatively short distance across the Alps. After completing his term of apprenticeship in 1489, Dürer followed the common German custom of taking a wanderjahre — in effect a gap year. Dürer was away nearly four years, travelling through Germany, Switzerland, and probably, the Netherlands. Dürer wanted to meet Martin Schongauer, the best engraver of Northern Europe, but Schongauer died shortly before Dürer's arrival. He stayed at the house of Schongauer's brother, and got some pictures that Schongauer owned. His first painted self-portrait is now in the Louvre. It was painted in Strasbourg, probably so that Dürer could send it back to his fiancée in Nuremberg. 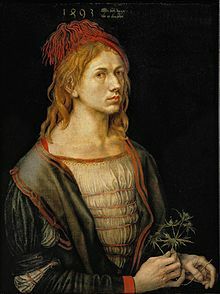 In fact, very soon after he got back to Nuremberg, on 7 July 1494 Dürer was married to Agnes Frey. She was the daughter of a well known brass worker (and amateur harpist) in the city. He was 23, and the marriage was arranged while Dürer was away travelling. his absence. They had no children, and most people think that they did not marry for love, but because it was good to link the two families. Also, a single man could not set up in business for himself in Nuremberg. Dürer painted some portraits of his wife, but experts say that they "lack warmth". The experts think that if Dürer loved his wife he would have taken more time over those pictures to make her look more beautiful and friendly. Young Hare, 1502, Watercolour and bodycolour (Albertina). Within three months Dürer left for Italy. The start of plague in Nuremberg was one reason for his leaving. In Italy, he went to Venice where artists were working in a more modern style. Dürer wrote that Giovanni Bellini was the oldest and still the best of the artists in Venice. On his return to Nuremberg in 1495, Dürer opened his own workshop. He started to use what he learned in Italy more and more, so his work was quite different from the other artists in Nuremberg who used only the traditional German style. Dürer's father died in 1502 and his mother died in 1513. Dürer probably did not cut any of the woodblocks himself. This was a job for experts. But he had designed and cut woodblocks for woodcut as part of his training in Wolgemut's studio, and he had seen many carved and painted altarpieces made in the studio. This means he knew what could be made into a woodblock print, and how to work with the expert block cutters. Dürer either drew his design directly onto the woodblock itself, or glued a paper drawing to the block. Either way his drawing was destroyed when the block was cut. His famous series of sixteen great designs for the Apocalypse are dated 1498. He made the first seven scenes of the Great Passion in the same year, and a little later, a series of eleven on the Holy Family and saints. Around 1503–1505 he produced the first seventeen of a set illustrating the life of the Virgin, which he did not finish for some years. Neither these, nor the Great Passion, were published as sets until several years later, but prints were sold individually in considerable numbers. The Venetian artist Jacopo de' Barbari, whom Dürer had met in Venice, visited Nuremberg in 1500, and Dürer said that he learned much about the new developments in perspective, anatomy, and Body proportions from him. de'Barbari did not want to tell Dürer everything he knew, so Dürer began his own studies, and he kept studying for the rest of his life. This is a series of drawings show Dürer's experiments in human proportion, before he made his famous engraving of Adam and Eve (1504). This is the only existing engraving signed with his full name. Dürer made large numbers of other practice drawings, especially for his paintings and engravings, and many survive, most famously the Praying Hands (1508 Albertina, Vienna). He also continued to make images in watercolour and bodycolour (usually combined), including a number of very beautiful still lives of meadow sections or animals, including his "Hare" (1502, Albertina, Vienna). In early 1506, he returned to Venice and stayed there until the spring of 1507. By this time Dürer's engravings were very popular and were being copied. In Venice he was given a valuable commission from the emigrant German community for the church of San Bartolomeo. This was the altar-piece known as the Adoration of the Virgin or the Feast of Rose Garlands. It includes portraits of members of Venice's German community, but shows a strong Italian influence. Later, the Emperor Rudolf II took it to Prague. Other paintings Dürer made in Venice include, The Virgin and Child with the Goldfinch, Christ disputing with the Doctors (supposedly produced in just five days), and a number of smaller works. Dürer was admired by the Venetians, but he was back in Nuremberg by mid-1507. He stayed in Germany until 1520. His reputation had spread throughout Europe. He was on friendly terms with most of the major artists of Europe, and exchanged drawings with Raphael. The years between and his journey to the Netherlands are divided according to the type of work he made. During the first five years, 1507–1511, after his return from Venice Dürer mostly painted. He made his four best paintings, Adam and Eve (1507), Virgin with the Iris (1508), the altarpiece the Assumption of the Virgin (1509), and the Adoration of the Trinity by all the Saints (1511). During this period he also completed the two woodcut series, the Great Passion and the Life of the Virgin. He complained that painting did not make enough money, so from 1511 to 1514 he concentrated on printmaking. The famous works he made in this period were the thirty-seven woodcuts for the Little Passion, published first in 1511, and a set of fifteen small engravings on the same theme in 1512. In 1513 and 1514 he created his three most famous engravings, The Knight, Death, and the Devil (or simply, The Knight, as he called it, 1513), Melencolia I, and St. Jerome in his Study (both 1514). 'Melencolia I' has a magic square which is believed to be the first seen in European art. The two numbers in the middle of the bottom row give the date of the engraving, 1514. In 1515, he created his woodcut of the Rhinoceros. The rhinoceros was in Lisbon, but Durer never saw it. He made it from a sketch and description from another artist. It was not very lifelike, but still being used in some German school science text-books early last century. The rhinoceros was from an extinct Indian species. Up to 1520 he produced a wide range of works, including portraits in tempera on linen, experiments in etching on plates of iron, and parts of the Triumphal Arch and the Triumphs of Maximilian which were huge woodcut projects ordered by Maximilian I, Holy Roman Emperor. In the summer of 1520 Dürer made his fourth and last major journey. He wanted to renew the Imperial pension Maximilian had given him. Maximilian had died in 1519, so the city of Nuremberg stopped paying it. Dürer also needed new patrons following the death of Maximilian, and to avoid an outbreak of sickness in Nuremberg. He took his wife and her maid and left Nuremberg for the Netherlands in July 1520, to be at the coronation of the new emperor, Charles V. He travelled by the Rhine to Cologne, and then to Antwerp, where he made many drawings in silverpoint, chalk, and charcoal. Dürer went to Aachen for the coronation, but also made trips to Cologne, Nijmegen, 's-Hertogenbosch, Brussels, Bruges, Ghent, and Zeeland. In Brussels he saw "the things which have been sent to the king from the golden land" — the Aztec treasure that Hernán Cortés had sent home to Holy Roman Emperor Charles V following the fall of Mexico. Dürer wrote that this treasure trove "was much more beautiful to me than miracles. These things are so precious that they have been valued at 100,000 florins". Dürer appears to have been collecting for his own cabinet of curiosities, and he sent back to Nuremberg various animal horns, a piece of coral, some large fish fins, and a wooden weapon from the East Indies. Dürer took many prints with him. He wrote in his diary to whom he gave, exchanged, or sold them, and for how much. This is some of the few times the price of prints was recorded, so historians think it very important to show the values of prints compared to paintings at that time. Dürer returned home in July 1521. He had an unknown illness which stayed with him for the rest of his life, and slowed his rate of work. Back in Nuremberg, Dürer started work on a series of religious pictures. There are many practice sketches and studies (practice paintings for a bigger painting) but no big paintings from this time. This was partly because of his illness, but more because of the time he spent preparing to write books about geometry and perspective, the proportions of men and horses, and fortification. His writings show that Dürer was highly sympathetic to Martin Luther, and he may have been influential in the City Council declaring for Luther in 1525. However, he died before religious divisions had hardened into different "Catholic" and "Protestant"churches. Dürer probably thought of himself as a reform-minded Catholic. Dürer died in Nuremberg at the age of 56. He left money and goods worth 6,874 florins - a considerable sum. His workshop was a part of his large house. His widow lived there until her death in 1537. The house is now a museum. ↑ The title of this article contains the character ü. Where it is unavailable or not wanted, the name may be written as Albrecht Duerer. ↑ 2.0 2.1 Mueller, Peter O. 1993. Substantiv-Derivation in Den Schriften Albrecht Durers, Walter de Gruyter. ISBN 3-11-012815-2.